Ahh candy! I don't think my kids need candy for halloween. So far they've come home with candy almost EVERYDAY from school. Why? Well apparently they are downright great kids and always do their work and are oh so helpful! And so the reward is always a? : You guessed it! Candy! I do not like that, but I digress. 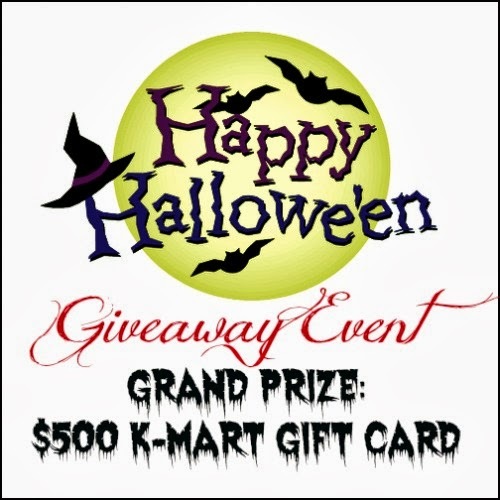 Come enjoy this fun event with us and enter for your chance to win in the K-Mart $500 GC Halloween Event! What did you do last year for halloween? A neighbor invited us to their friend's house. It was a nice gesture, but I didn't know anyone there and unlike my kids enjoying the other kids, I was bored stiff and feeling out of place. Next time NOOK will not be forgotten! So cute; the costumes in your "You also might like" and the many tempting photos left by those linking up.